The CrushExpress® is a device for crushing organic samples and is conceived for the application in plant and animal biotechnology as well as in food analytics. 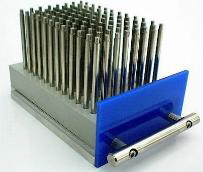 Based on its specific construction the device is particularly appropriate for high sample throughput. 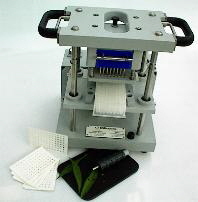 The device simultaneously crushes small (fresh or dried) sample quantities (max. 100 mg) in buffer (approx. 100-300 µl) in common 96 Deepwell-Plates (or Micronic tube arrays, 1.2 ml). The machine was originally develloped for crushing plant leaf samples for the extraction of DNA. Extensive experiences are present in the meanwhile for this application. Thus e.g. from 3-4 leaf circles (5 mm diameter) of barley, rye, wheat, corn and rapseed on average 500-1000 ng of DNA is yielded. Common protocols as chloroform extraction combined with alcohol precipitation lead to DNA of good quality which is suitable for the use in PCR assays e.g. microsatellite markers or STS marker analyses. One person can perform easily more than 1000 DNA extractions per day with help of a microtiter centrifuge and 8-channel pipettors. The CrushExpress is also useful in sample setup for storage-protein electrophoresis of grains and isozyme analysis of plants and to homogenize samples of food e.g. from saussage or cheese. In principle, all kind of tissue can be crushed. In particular homogenization in buffer offers various possibilities of combining mechanical crushing with upstream thermal treatments or with the use of specific buffers. The replacable tappet heading and the smooth surfaces of the pin-head ensure an easy cleaning of the components which get in contact with the samples. Additionally possible reciprocal liquid crossings are excluded from cavity to cavity by a prepunched filterpaper which is put on top of the deepwell plates. The tappet heading can be got out by raising the black button on the top side and pulling the tappet heading forward. Keep attention that the black button locks by reinsertion of the tappet heading. The Deepwell plate filled with samples (ca. 100 mg) and buffer (max. 400 ul) is inserted into the sample carrier. The prepunched filterpaper is put directly on the Deepwell plate . It is to be made certain that the holes in the paper fit together with the wells of the Deepwell plate. By lateral pulling out the silver grips, which are close to the black handles, the tappet carrier is released from its adjustment and can be moved downward into the working position. A defined downward movement helps to drive the pins through the filterpaper. The release of the grips enables to lock the tappet carrier in the working position. Now the tappet carrier is fixed in the working position and the filterpaper is pressed firmly on the surface of the Deepwell plate. The crushing is started after plugged in and the start of the clock. It will stopped after running the set time is finished. For the release of the tappet heading the silver grips must be pulled again sideways and then upwards to lock in the upper adjustment. Because the filterpaper tightly fits to the tappets excess sample liquid is stripped off and sucked up. Dropping of buffer and cross contamination is prevented in this way. After the tappet carrier is fixed the procedure is finished. Take out the Deepwell plate. For further handling just remove the filterpaper. By lifting the button at the top of the tappet carrier the tappet heading can be pulled out. Rinsing the tappet heading under hot water is usually sufficient to wash sample liquid complettely off. If necessary also a mild soap solution and a brush can be used. The wet tappet heading can be dried by air pressure or hot-air fast and easily. All mobile components of the device are shielded and prevent an intervention during the operation. For safety reasons make sure that everytime the machine is switched on a Deepwell plate is inserted and the tappet carrier is fixed in working position. Due to its simple construction the CrushExpress is an almost maintenance-free device. Only the exenter axle of the drive must be greased after approximately 200 crushings with a suitable fat e.g. the fat OKS 470. If the spring force of one individual tappet should diminish, then it can be exchanged by simply screwing of the tappet heading either on your own or by the equipment manufacturer Meku. Please send only devices for repair, which are cleaned and free of health-endangered materials. The device surfaces can be cleaned with water, a mild soap solution or if necessary also with isopropyl alcohol. Expendable material such as fat and filterpaper can directly obtained from the manufacturer, the Meku Erich Pollaehne GmbH (see adresses). The guarantee amounts to 6 months. In the case of loss during shipping please turn immediately to the Saaten-Union Biotec GmbH. In case of break down during the use you can send the device under attaching the invoice and detailed description of the complaint reasons directly to the manufacturer. For resuming questions the coworkers of the Saaten-Union Biotec GmbH can be contacted. In particular it is pointed out that for different applications e.g. DNA extraction, detailed protocols and information for the integration of the CrushExpress into automatic processes are available. Adjustments of the CrushExpress to your special claims might be possible. The laboratory instrument CrushExpress and the crushing procedure in DeepWell plates are invention-legally protected (patent pending).